Big carriers usually have modules for integration with Prestashop. Such companies as UPS, USPS, FedEx etc. will soon have modules for Pretashop 1.7, but I am not so sure about local carriers: as some of them didn’t even have integration with previous versions, it’s unlikely they will have an integration with Prestashop 1.7. Unless they boost their business, they will stay local carriers and you will have to integrate them to Prestashop yourself. In this post I’ll walk you through the process of adding a carrier and will explain you step by step how a new carrier (probably small, but so valuable) can be added to the latest version of Prestashop (1.7.0.0) that is currently being actively tested. Probably by the time you decide to develop your business on Prestashop 1.7, the full release will be completed and all small bugs in the current version will be fixed, but the functionality will stay the same. 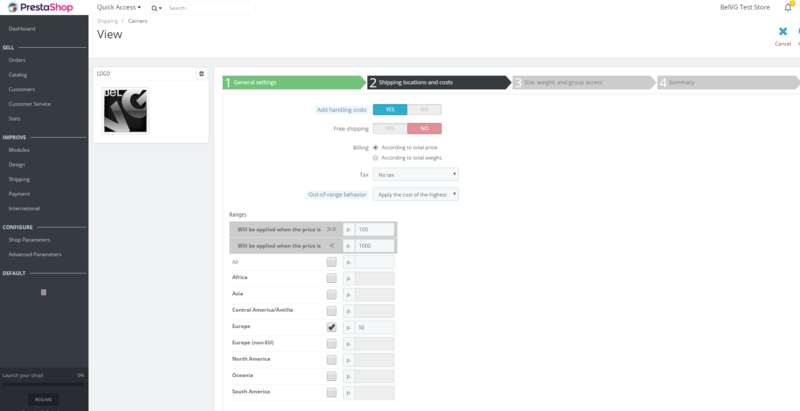 After a Beta version of 1.7.0.0 has been released by Prestashop, we can finally have a proper walk-through and check the way the admin panel of this version works. Ok, now let’s try to add your favorite carrier that isn’t as popular as FedEx and USPS to have their own integration with Prestashop. There are 3 main sections in the Prestashop menu: SELL, IMPROVE and CONFIGURE. At the right top of the page you can see the “Add carrier” sign. In the first step you need to enter your Carrier’s name, its Transit time, Speed grade (from 1 to 9), upload its logo and add a tracking URL (if they have a possibility to track shipments on their site). A more interesting stuff starts here. 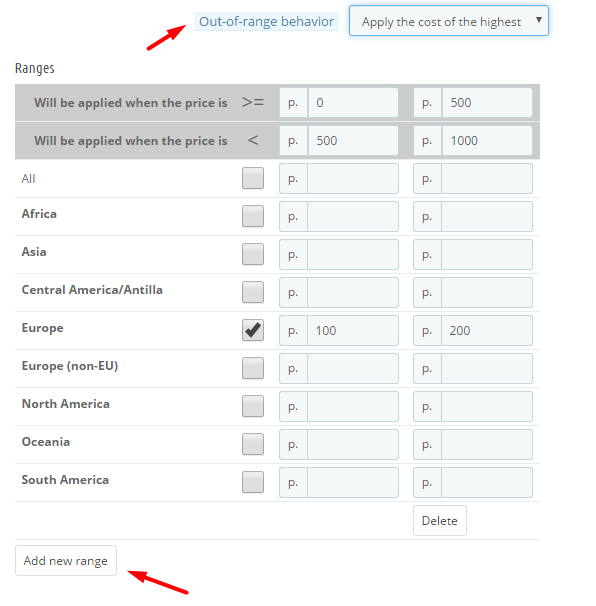 In Step 2 you can define a shipping price and how it will be calculated. The first choice is whether there will be a handling cost (the cost of packing the shipment. If there is special price for handling, then you can define it in Shipping – Preferences. If the boss of this carrier is your good friend or owes you tons of money (or if you just want to offer your clients free shipping), you can say “Yes” to “Free shipping” and all shipping using this particular carrier of yours will be free of charge for your customers. Either way you choose, you’ll have to fill in the table. Let’s say you want to define shipping cost depending on price. You’ll need to define ranges. On the screenshot you can see how I defined the following: if a client is from Europe, if total price paid is from 0 to 500 Belarusian roubles, then shipping cost is 100 BYN. If from 500 to 1000, then shipping cost is 200 BYN. But what should happen if a customer orders something for than 1000 Belarusian roubles? In Out-of-range behaviour you can choose either this carrier (shipping method) won’t be applicable or the highest shipping cost will be applied. Define limits of this carrier: max dimensions and max weight. Also you can define which customer groups can access this carrier. You can see the summary of this carrier and press Finish. Now if you try to add something to cart and proceed to checkout, you can see the shipping cost is applied. hello, please how to delete the delivery step in prestashop 1.7?